At long last, and after many of the inhabitants had almost given up hope of seeing a public war memorial in their midst, Saturday saw the unveiling of the monument an accomplished fact. The monument is in the form of a Celtic Cross of Aberdeen granite, standing 18 feet high, on a broad base which contains three panels on either side and one at each end, in seven of these panels are inscribed the names of 227 men who were killed or died on service in the war. On either side of the upright column of the memorial is a pendant sword, while underneath is a laurel wreath. There are inscribed on the upper portion the words, "Their name shall live for evermore." In one of the centre panels is the inscription, "Erected to the memory of our men who laid down their lives in the great war, 1914-18." The work was executed by Messrs Scott & Rae, Glasgow. An iron railing with gate surrounds the monument, the railing being the work of Mr McLay of Kirkintilloch. The cost of the memorial is fully £500. The weather, unfortunately, did not deal kindly with the occasion. Rain commenced to fall during the proceedings and was coming down heavily, before the close of the programme. A procession was formed at the Academy grounds and marched round the town and along Station Road to the Burngreen. The Town Band led the way, followed by ex-service-men, the memorial committee, representatives of public bodies, Public Band, Girl Guides, Cadets, and Boy Scouts. The Territorials formed a guard at the monument. Apologies for absence were sent by Mrs. Moncrief, Mr. Thomas Johnston, MP, and Mr. James Boyd. The burgh flag and the flag at the Bowling Green were flown at half-mast. A platform was constructed beside the memorial. On this members of the memorial committee, the clergy, and others taking part, Mr. Charles Edmonstone, and Mr. C. E. Horsbrugh had seats. Ex-Provost Cook, chairman of the memorial committee presided. Members of Kilsyth Co-operative Choir and friends, under the leadership of Mr. James H. Gibson, led the singing of the 46th. Psalm. Rev A. G. Millar, High U.F. Church, delivered the prayer of invocation. In thanking God for granting victory to our arms he prayed that as God had given us victory He would help us to reap the fruits of it, and not lose the fruits of it in peace. He prayed that, as we went backward and forward, the monument would not only remind us of those brave men, but be an inspiration for us all to live lives worthy of the great sacrifice made on our behalf. The Town Band, in the Bandstand, rendered "Memory of the Brave," and the buglers sounded " The Last Post,"
One minute's silence was observed. Then the buglers sounded "Reveille." Ex-Provost Cook said that they had with them that day Sir Archibald Edmonstone, Bart., who needed no introduction to a Kilsyth audience. The memorial committee considered that Sir Archibald was the right man to unveil this memorial. He was one who had taken a deep interest in the community and had the deepest sympathy with those who mourned the loss of near and dear ones who fell in the war, and was one who had known that very sad experience of weary waiting for news from the front, and also, alas, the pangs of the final blow. They were greatly honoured in having Sir Archibald with them that day, and he (the chairman) had much pleasure in calling upon him to unveil the war memorial. Sir Archibald Edmonstone said :- My friends, ladies and gentlemen, we are assembled here for a very solemn purpose. We have come together to do honour to the memory of the 227 brave men of Kilsyth who gave their lives for us in the great war. I know that words can very feebly express our deep feelings and emotions – and mine, I fear, must be very few and faulty- but I would like to say this: I do not think that this occasion should only be looked upon as a sad one and full of sorrowful retrospect. On the contrary, I think our minds should be filled with pride and thanksgiving for the precious possession which has been given us in the memory and example of these gallant men. 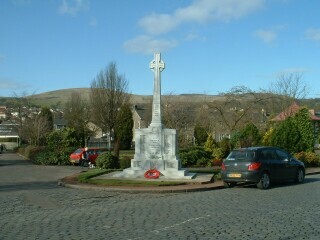 I hope, and believe, that this beautiful monument round which we stand may prove a blessing and help to many in Kilsyth. To those who mourn, surely it will be a great consolation and happiness to see always in their midst o perpetual emblem of the honour and reverence of those they loved. Then, again, to many others, I think it will be a help, you know, ladies and gentlemen, there come in every life moments of crisis and doubt and indecision, when there seems a parting of the ways – one steep path leading upwards towards duty and self-denial, and the other sloping downwards to self-indulgence, ease, and carelessness. At such times, when men look upwards to this memorial, perhaps a voice will come from it, saying : "Remember us ! Think of us ! We were young ; we were happy : we loved our lives : we loved our homes, and yet we gave up everything, to do our duty and the serve our King and country." I hope, please God, that those who listen will be given strength to follow worthily in the footsteps of these gallant soldiers trod. Ladies and gentlemen, I know of no finer words that I can quote than those spoken by H.M. King George when he viewed the graves of his fallen soldiers in France. The King said- I fervently pray that both as nations and individuals we may so order our lives after the ideals for which our brethren died, that we may be able to meet their gallant souls once more, humbly, yet unashamed. I have now the honour to unveil this beautiful memorial. May it stand sacred for ever in Kilsyth. Sir Archibald drew the cord which allowed the covering to slip from the memorial. The Public Band played "For King and Country." Church bells were rung . Rev Duncan Cameron, Parish Church, delivered the dedicatory prayer, humbly beseeching Almighty God that He would consecrate their thoughts and purify their hearts, that they may worthily be remembered among the men who gladly laid down their lives for the sake of their country and kindred ; that God would strengthen us that we might walk worthily in their footsteps ; and might the remembrance of all they did and suffered be an inspiration and strength to us throughout all our days. In the name of this community, and by their request, he dedicated for ever to their memories this memorial of their sacrifice and of their heroism, and might God grant unto us that the memory of these heroic men might ever be fresh and beautiful in our souls. Kilsyth Pipe Band played a lament. Captain Norman Anton led of the placing of the wreaths round the foot of the monument. His was followed by many others. This proved the most touching part of all this afternoon's ceremony. Some were as gorgeous as the garden or greenhouse could supply, others as clever as the imitator of nature could fashion them, and others simply little mementoes carried by widows to commemorate departed husbands, little children in memory of their dad who never came back, by parents who recalled a boy they lost, or sisters mindful of a brother. Many found their grief welling up in tears, and it was a severe trial to come forward to deliver their floral tributes to place on the memorial. After Kilsyth Co-operative Male Voice Choir had sung "Soldier, Rest, thy warfare o'er,"
Parish Councillor Alexander Arneil, moving a vote of thanks to Sir Archibald Edmonstone, said they were delighted to have him with them that day, to mingle his sorrow with their sorrows, and they thanked him for coming such a long distance to be present. Some might think their efforts had been small after all the boys who had gone had done for them; yet it was their names were inscribed on the memorial. To express how deeply he felt the sorrow which had come upon Kilsyth recently through the pit disaster. It was so awfully sad to think of, and he felt so much for those who had been so terribly bereaved amongst them. The chairman said he had something very important to say, but the weather seemed to be breaking down and it would not be fair to continue the proceedings too long. They could scarcely think that it was nine years 21 days since their empire went to war. Hundreds of their brave men answered to the call of King and Country; and, alas, many of them never returned. At the close of the war, scheme after scheme was put forward for some kind of memorial which they felt ought to be raised in memory of the brave men who made the supreme sacrifice. Scheme after scheme was discussed and allowed to drop. At last the committee felt that the duty was incumbent upon them to carry through a memorial of some kind. They would have liked to have been in the position to have raised something far larger than they really had got. But it was not the size of the of the monument that would matter, for no matter how large any monument might be that they could erect, it would be as nothing to the debt we owed to the brave men who had laid down their lives. He took the opportunity to express their heartfelt sympathy with those who had lost near and dear ones in the war, and on behalf of the committee, thanked those is any way helped to erect the and carry out the arrangements in connection with the war memorial. At this stage, in name of the war memorial committee and the inhabitants of Kilsyth and district, he asked Provost Freebairn as representing the Town Council, to take this memorial into their care and keeping. The trust, no doubt, was a sacred one, a trust which the relatives of the men whose names appeared on the tablets had reposed in him, and he hoped the Provost would see that trust carried through to the full. Provost Freebairn said it was with the greatest pleasure that he, on behalf of the Town Council accepted custody of this war memorial. The Council accepted it as a sacred trust, and the war memorial committee would see that every care was taken of the memorial, and all they could do would be done for the sake of the memory of those who made the supreme sacrifice. There had been something said of the men who had made the supreme sacrifice, and they were all agreed with everything that had been said. There was just one thing he would like to say in addition, and that was that they ought to remember the many who were walking about – living dead. Many were young men who began life with bright prospects or were looking forward to something away in the future, laying their plans and having their ambitions like those other men who went to the war. He thought they also had made a supreme sacrifice for us. It was quite within his recollection when he used to go into Glasgow before the war, that he might walk through the greater part of the city and he would scarcely find one man in the same position as he was. But he found now that it was hardly possible to turn a street corner but he had a companion in misfortune; and many with had to put them all aside and bow to the inevitable. He hoped the Government and the whole community would see their plans and ambitions in front of them to it that they did not forget what these men have done. He thought it was just as bad for those men walking about half-dead as those who who made the sacrifice completely. He was putting in a word for the men who had been disabled and would have to bear the brunt for many long years. He had much pleasure in accepting this trust, and the Council would do all in their power to keep the memory of these men green.